9’ Billiards | Pool Tables are large and challenging tables suited for the most skilled billiards players. 9’ Tables have playing surfaces with a length of 100” | 254 cm, width of 50” | 127 cm, and are set at 29 1/4”-31” | 74.3-78.7 cm high. A 9’ Pool Table has an overall size of 114” x 64” | 290 x 163 cm and a height of 32” | 81.3 cm. 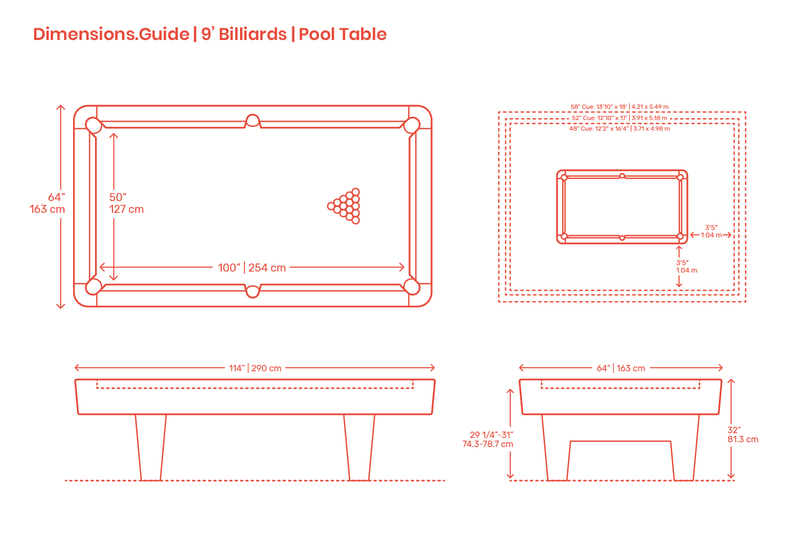 A clearance space of at least 12’2” x 16’4” | 3.71 x 4.98 m should be provided for a 9’ Billiards | Pool Table.